THE STORY - Nels Coxman's quiet life as a snowplow driver comes crashing down when his beloved son dies under mysterious circumstances. His search for the truth soon becomes a quest for revenge against a psychotic drug lord named Viking and his sleazy henchmen. Transformed from upstanding citizen to coldblooded vigilante, Coxman unwittingly sets off a chain of events that includes a kidnapping, a series of deadly misunderstandings and a turf war between Viking and a rival boss. 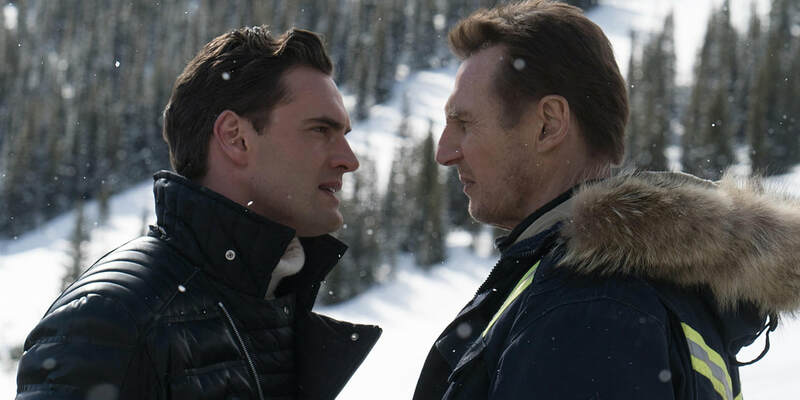 ​At this stage in his career, Liam Neeson has carved out a nifty space for himself as the purveyor of a certain kind of action movie. For many, all they need is for Neeson to show his grizzled face and a strong determination to take down a group of bad guys. Ever since “Taken”, these movies have been quite successful for his career but have seen a series of diminishing returns as they’ve gone on. There are certainly familiar trappings in this particular film, but there are also some unique elements about it that make it stand above the pack from many of the mediocre films that have come before it. Neeson stars as Nelson Coxman (the humorous nature of that name is something the film is fully aware of). Coxman drives a snow plow in the Rocky Mountains to make sure the roads are continually clear. His idyllic and isolated life is thrown into chaos when his son is found dead from a suspected drug overdose. However, Coxman does not believe that is the true cause of his son’s demise. This takes him into a world of assassins and drug runners, the head of which being the sadistic and manically detailed Trevor Calcote (Tom Bateman), who also goes by the name “Viking.” Throughout his quest for vigilante justice, Coxman pits crews against each other all in a race to satisfy his thirst for revenge and bring the responsible parties to justice. I have not seen the Norwegian film, “In Order of Disappearance”, on which this film is based on. However, just by glancing at the trailer, there is a noticeable amount of similarities between the two projects, both in style and scene construction. This is probably no surprise since they are directed by the same person. I cannot speak to whether or not Hans Petter Moland is being repetitive here, but I can say I appreciated his touch all the same. What is most surprising is just how much dark humor is layered throughout this entire film, and it helps the film keep being quite engaging. Moland finds comedic elements that fit well within the tone and help accentuate the entertaining aspect. Frank Baldwin’s script could very well be a carbon copy from the original film, but I did like much of the film’s execution. Admittedly, the structure is a bit odd at times and the story feels like it’s much more enamored by the villains that its protagonist. But there’s a playful energy to it that mostly knows how to play up the absurdity. Much of it feels in the realm of “Fargo”, though obviously several notches below in quality. Still, there is a charm to see such a violent revenge picture played out against darkly comedic moments, and it serves the piece as a whole quite well. Just as the story itself seems to regard Coxman as the least interesting character, the same could be said of Neeson’s performance. It’s nothing downright terrible, but it does seem at this point that, after so many of these old man action movies, the well is starting to run dry. He’s serviceable but quite forgettable, which seems to be a staple of many of his roles as of late. Truthfully, it’s the characters around him that make a far greater impact. Bateman’s villain sometimes stretches farther than it seems the actor is capable of, but he brings a charming tenacity to his controlling nature. There’s also a revolving door of henchman, as well as members of a rival drug gang populated by Native Americans, and they all add a special flavor in their scenes that are utterly delightful. Unfortunately, this is yet another film with very little for the female characters, and that is particularly felt in an utterly useless role that is given to Laura Dern as Coxman’s wife, and it’s a part that is not deserving of an actress of such talent. Emmy Rossum does her best as one of the town’s police officers trying to solve this case, but even she doesn’t add enough to feel truly memorable. That element is the one thing about this ensemble that is disappointing for a film that overall is filled with fine performances. The film certainly has some elements to it that keep it from being great. It does run into some pacing issues and some sections of the story prove to be more engaging than others. Neeson is not a very compelling figure, nor does his character feel like an interesting person to follow. At the same time, there is a dark sensibility to the humor that felt quite refreshing and coupled with a collection of amusing side characters, that ended up benefiting the film a good deal. I have no doubt that Neeson will have more action flicks in his future, but I hope more can aspire to be as interesting as this one.